Does my bum look big on this? If like me you're sick of persistent intermittent electrical problems (read occasional refusal to start), then you might have an interest in parts of the loom. Specifically what each of the connectors are, and what the part numbers for the various bits are for replacement. I've got my loom in a thousand bits, and as part of the exercise I've been documenting exactly that. I thought it'd be a good idea to share. So here goes, in no particular order. I have no idea of the part number for these (the body and engine ones are subtly different) nor of where to buy individual terminals. The whole lot is available as a kit from Competition Systems (http://www.mmcompsys.com/assets/Ducati%20wiring%20parts%20retail%20price%20list_01.pdf, though they're painfully expensive. Note they have most of the connectors on the bike available in kit form too, but the cost is pretty high. This is the connector that goes on the little air pressure/temperature sensor that Ducati stuck right behind your headlight. I'm unsure of what the shell is called, but the terminals are AMP Junior Power Timer terminals, part no. 929940-1 (google that part number to find a distributor in your area - I've been buying mine from http://www.mouser.com, which is an electronics wholesaler.). They fit a wire of 0.5 to 1.0 mm2. If you need to go bigger, there's 929938-1, which covers really big cables of 1.5 to 2.5 mm2. The little boot on the back of the wire is needed to seal it, and it's mandatory. I've been using 281934-4, which are green and suit wire of 1.2 to 1.6mm outside diameter. There's also a yellow one (281934-2) which suits larger wires 1.7 to 2.4mm diameter. 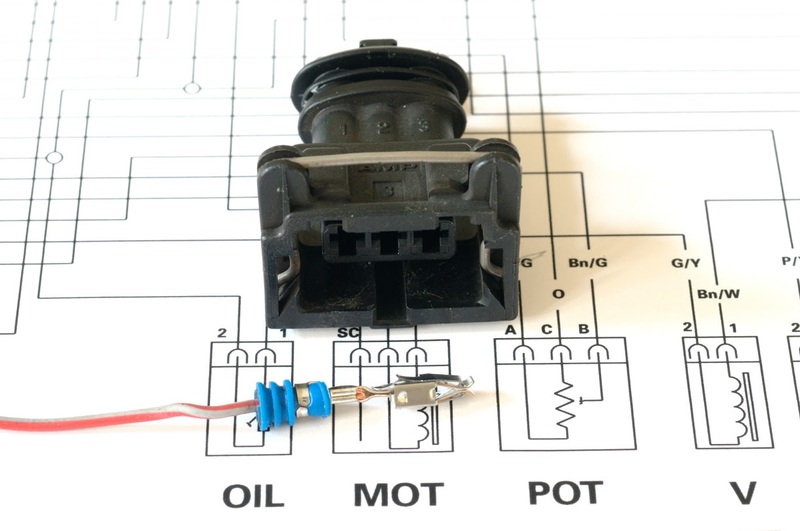 This is the connector that goes on the throttle position sensor, opposite the throttle cam on the throttle bodies. It's a Delphi metripack 150.2 pull-to-seat. It's an annoying connector, as you have to put the seal, then the shell on the wire, then strip and crimp the wire as it hangs out the front of the connector before pulling them back to seat. Getting them back out again is really hard, and you can't pull the shell off the wiring without cutting the terminals off. The terminals are part no. 12124076-L. The seal comes with the connector shell, and is reuseable. These are all variants of AMP Junior Power Timer connectors. As for the TPS connector, terminals are part no. 929940-1. They fit a wire of 0.5 to 1.0 mm2. If you need to go bigger, there's 929938-1, which covers really big cables of 1.5 to 2.5 mm2. The little boot on the back of the wire is 281934-4, which are green and suit wire of 1.2 to 1.6mm outside diameter. There's also a yellow one (281934-2) which suits larger wires 1.7 to 2.4mm diameter. I haven't as yet been able to find the part numbers for the terminals. 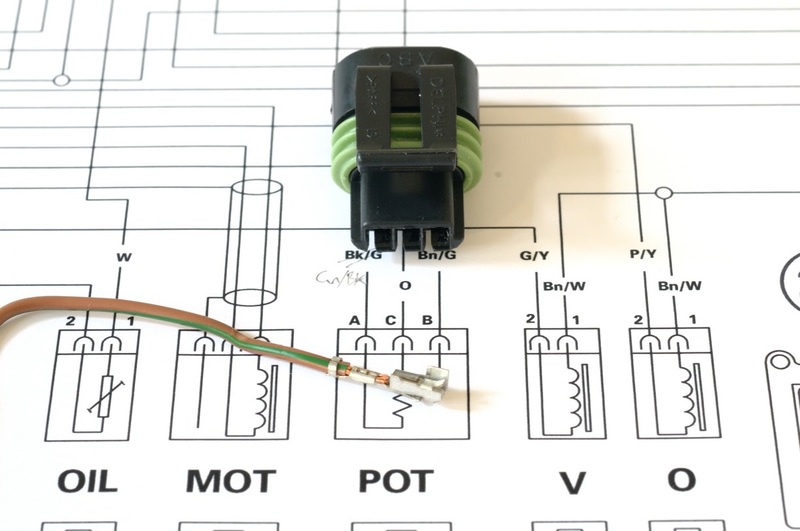 The connector is available from Competition Systems as a whole kit (see entry for ECU connectors). These are far and away the most common connector on the bike. They're used for the tail loom connector, fuel pump, headlight, O2 sensor, side stand cutout, etc etc. In any case, two different size terminals are available: 282110-1, which suits 0.75 to 1.5 mm2 wire, and 282403-1, which suits 0.3 to 0.5 mm2 wire. 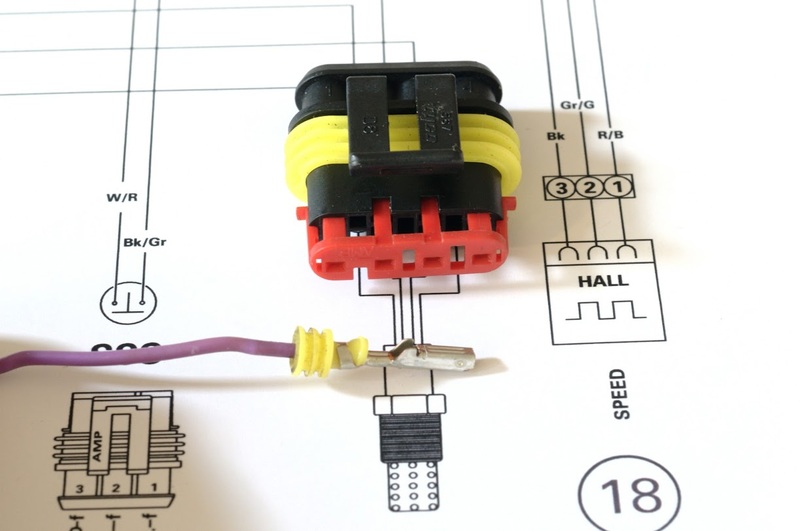 Seals are as for the Junior Power Timer connectors: 281934-4, which are green and suit wire of 1.2 to 1.6mm outside diameter, and yellow (281934-2) which suits larger wires 1.7 to 2.4mm diameter. These are also an AMP superseal connector, though share nothing in common with the superseal 1.5's that are everywhere else. In any case, the terminals are part no. 3-1447221-3, and are a relatively easy push fit into the back of the connector, after opening the gate (push the little white bit. That's it for now. 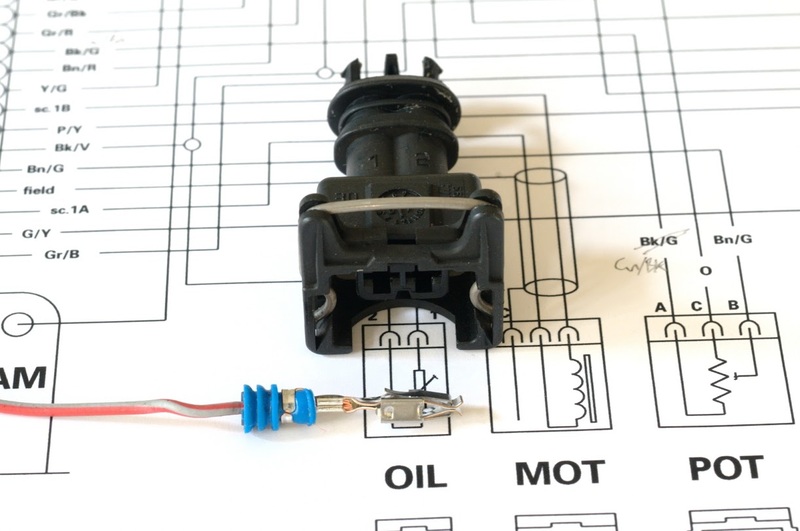 There are also numerous non-sealed 6.3mm tab connectors (ignition, rectifier/regulator etc) that need to be covered. I'll do that later. 2007 Monster 695 with a few mods. 2013 Piaggio Typhoon 50 2 stroke speed demon. Thanks for the useful info Suzy!! -Though I've got a KTM as well and they use a pretty wide variety too, for no apparent reason. Nice write up Suzy. You're bringing some real in-depth tech muscle to the board. I've learned a number of good tings from you. Keep it up, please! -Throttle's on the right, so are the brakes. Good luck. - '07 Triumph 675 Track bike. So maybe since you did all that work you can answer my question. I am trying to build a wire harness to connect an Innovate LM2 datalogger to a Monster S2R, without messing up the existing wire harness. I have made a male/female connector for the RPM sensor, but I can't figure out how to do it with the TPS sensor. It's like there is no opposing connector for the MetriPack 150.2 PulltoSeat connector. Is that true? Any substitute that will work? Suzy or anyone know where to get the male version of this to enable using an aftermarket gauge cluster ?? Will this thread get a sticky? Some later Ducati Monsters (2007-2010) use a Bosch 4-wire single-unit air temperature/pressure sensor. 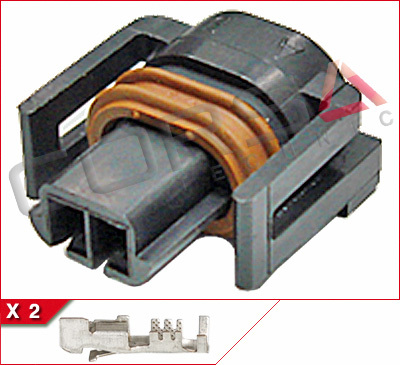 It's a MAP sensor with an oval connector (BOSCH 0 261 230 030) common to many European cars. The connector you pictured is apparently one of those Ducatis. 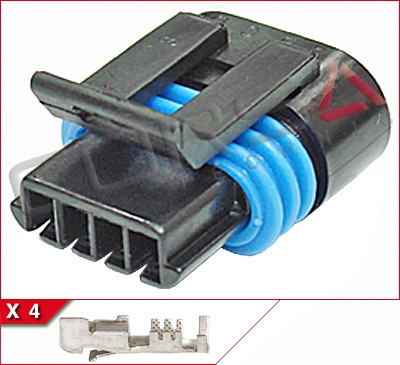 The connector is called "4-way sealed Plug Bosch BSK Connector for Bosch MAP Sensor". (This also means it is likely easier to find replacement sensors). 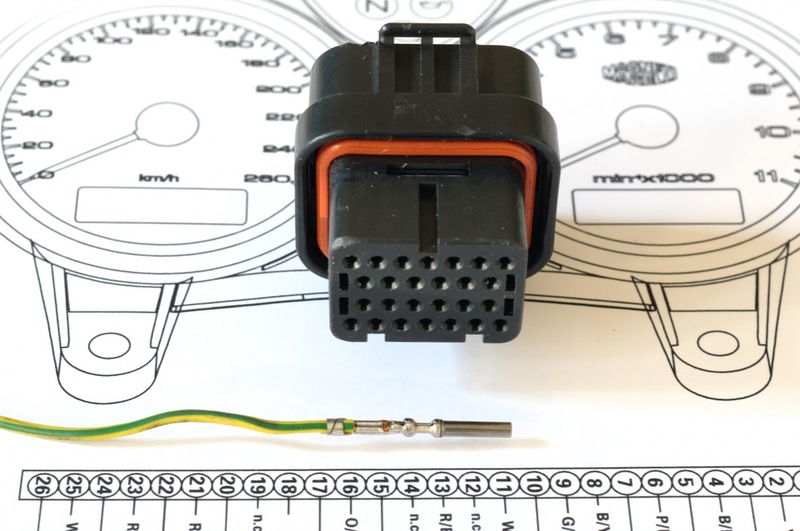 Ducati sensor part number 552.4.031.2B. Some earlier [non-CANbus] Ducatis (2003-2007) use a Magneti Marelli 4-wire single-unit air temperature/pressure sensor. These use a "12162188 from Metri-Pack 150.2 Pull to Seat Series" connector. The Marelli sensor is 552.4.031.1A and is likely Ducati-specific*. CANbus Ducatis (Superbike, etc) have a barometric air pressure sensor that is integrated into the dashboard PCB so that data is transmitted over CAN bus to the ECU and the sensor is non-serviceable. 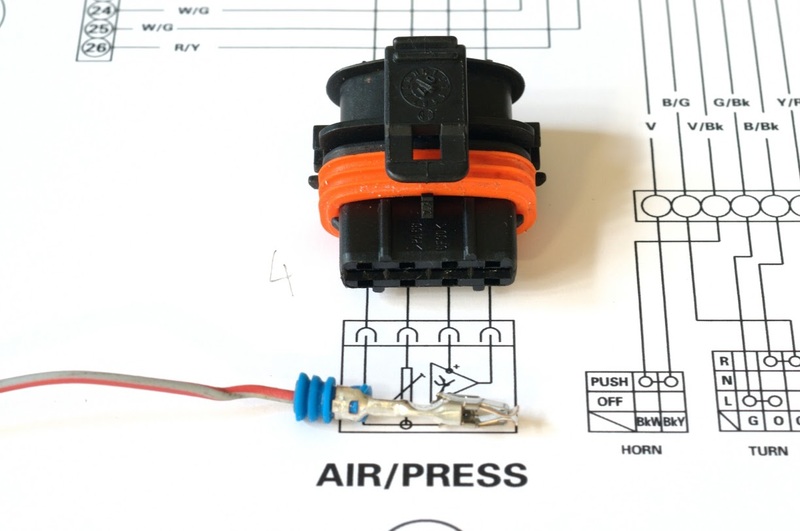 The only external air sensor is a 2-wire air temperature sensor that uses a "12162215 from Metri-Pack 150.2 Pull to Seat Series" connector. The sensor is 552.4.012.1A. 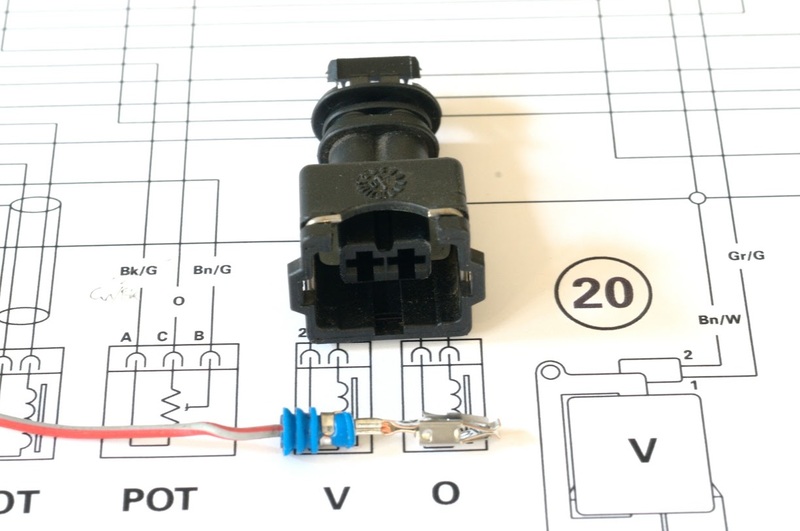 Regarding the ECU connector, I e-mailed Cinch directly about their 38-way locking connector and was informed they sold the tooling to Molex back in 2005. When I contacted Molex they claimed it was no longer in production. Replacement pins and the pin removal tool are extremely similar (functionally interchangeable) with Molex's CMX/CMC series, thankfully. Unfortunately the housings can now only be obtained from scavenging. However, some Fiat cars also use the same connector, so our friends in Europe might have an easier time of it in the junkyard. 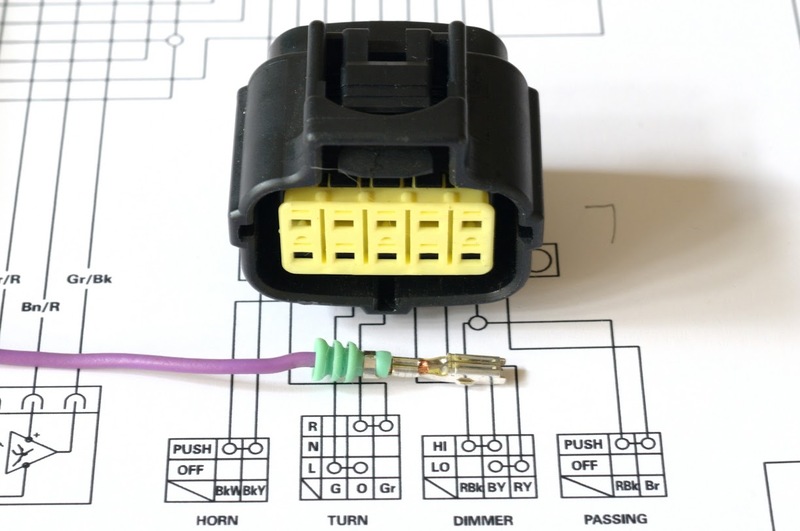 Hi all, any advice on where I can find a copy of the wiring schematic used as the background for the photos, I see it has the pin numbers and wiring for the Marelli 5AM ecu which would be a really handy reference, thanks. Often the very last page in the Owner's Manual. As long as this thread has been brought back, does anyone know what kind of connectors are used on the newer bikes for the switches or turn signals? They look similar to Deutsch, I can post photos if that would help.